Our purpose is to make your life simpler and healthier. EASY TO CLEAN & SAFE. Detachable attachments are easier to clean, chemical free with ETL, FDA Certificate, dishwasher safe and BPA free. MILK FROTHER ATTACHMENT: Portable hand-held milk frother makes milk foam for your coffee. MORE POWERFUL. 250 Watt powerful hand blender with 8 - speed + turbo for milk shakes, soups or baby food. Low noise and shake. HIGH-EFFICIENCY BLENDER. Thick stainless steel mixing wand with 4 - blade system. Make food mixing more efficient, evenly and smoothly. 5-in-1 ATTACHMENT & WARRANTY: mixing wand, milk frother, 500ml Food Chopper, 600ml Beaker, Egg Whisk with 2-year warranty. the instruction book carefully before using. - The electrical requirements volts: 110-120v. - The chopping bowl lid/Whisk gear is not dishwasher safe. - Do not keep pressing "Power"or "Turbo" button nonstop for longer than 1 minute. - Be sure the food is cut into small pieces before putting into the chopping bowl. EASY TO INSTALL - This sleek immersion blender features an ergonomic handle with simple one-touch operation, simply press & blend. 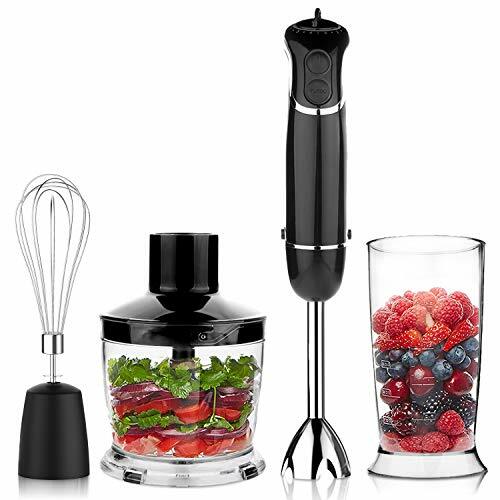 BPA-FREE - Includes 600ml beaker, 500ml food processor, whisk attachment, plus splash guard to prevent food splatter. 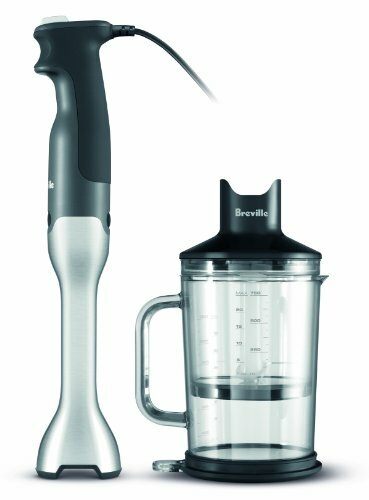 Why the Breville Control Grip Immersion Blender? Sometimes, making a simple soup can be hard work. Immersion blenders are supposed to make cooking easier, but they can often create problems instead of solving them: creating splatters, suctioning to the bottom of the bowl, and scratching pots. How can you control the power you need to get the texture you want? New design for excellent performance The Breville Control Grip s blade system has internal ribs that create turbulence. This unique system makes sure the food falls onto the blades, reducing suction to the bottom of the pot. These features make the Breville Control Grip excellent for multi-tasking, whether it s blending, emulsifying, whipping, or pureeing. Use it to make velvety soups, thick mayonnaise, fluffy whipped cream, chunky pesto, dips, and salsa, smoothies, baby food and more. 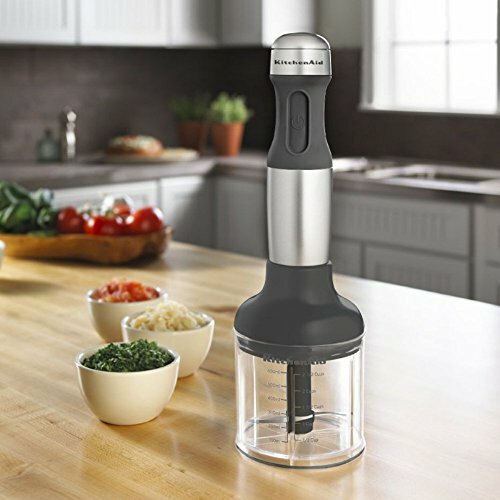 Get a grip on excellent blending The Breville Control Grip features an ergonomically optimized handle designed to fit your hand comfortably. Trigger operation keeps your hand in natural position for more stability and control, and its soft touch finish makes sure it s easy on your hand, even when it s hard on your food. Designed with the Consumer in Mind With all of these features, it s no wonder that the Breville Control Grip has been rated the best immersion blender by a leading consumer magazine, beating out higher priced models. It s built with high quality materials: both the blending shaft and the ice-crushing blades are made of stainless steel, ensuring durability. 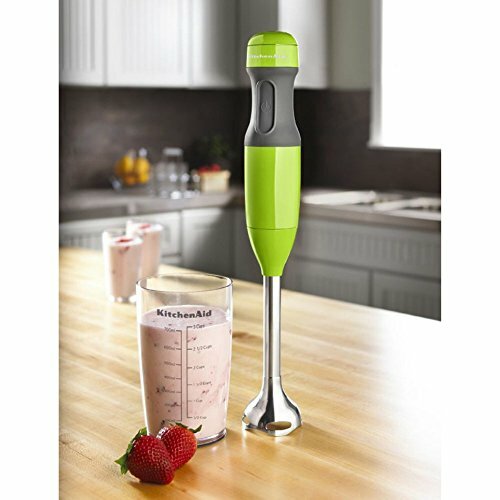 A 6 foot extra-long power cord makes the unit portable and convenient, providing the mobility of a cordless immersion blender but making sure that it is always ready to go when you need it (no charging necessary). The bottom of the blender has a non-scratch base to prevent it from scratching your non-stick pots. It also comes with a handy whisk attachment for cream, egg whites, or light batters, as well as a blending jug and chopping bowl. The chopping bowl can be stored compactly in the jug for convenience and the lid of the blending jug can be used as a base to prevent slipping while blending. Easy clean parts can be hand washed and most parts (except motor, chopper lid and whisk gear box) can be washed in the dish washer on the top shelf only, making cleanup quick and easy. Variospeed technology: the one-handed design and 21 distinct speeds offer ultimate control, allowing you to maintain precise and consistent speeds for the best spiraling results. 3 spiraling blades: 3 versatile blade options will have you quickly creating narrow, medium and wide spirals to suit a large variety of dishes. 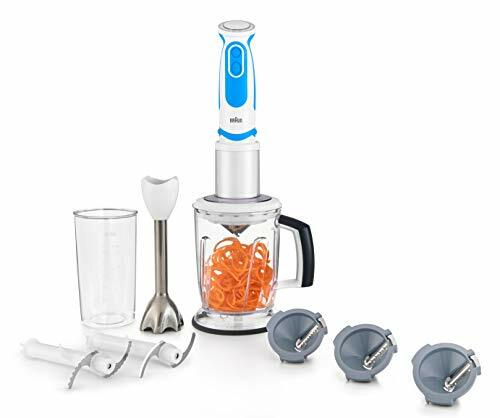 Multifunctional versatility: the provided additional blade attachments easily convert your Spiralizer into a 5-cup chopper, a 5-cup blender/ice crusher or a hand blender featuring Braun's unique power bell plus and splash control technologies. Easy to clean thanks to the cleaning brush and dishwasher-safe parts. Easy click accessory system: go from spiraling to blending, chopping or pureeing in seconds. Increase functionality with other Braun attachments for whisking, mashing and food processing. Battery power, no hassle with electric cords. Perfect to use at home or in a commercial kitchen. Used to fully mix the egg white and egg yolk of the egg. Add iconic style to your kitchen with this unique, limited-edition KitchenAid hand blender. 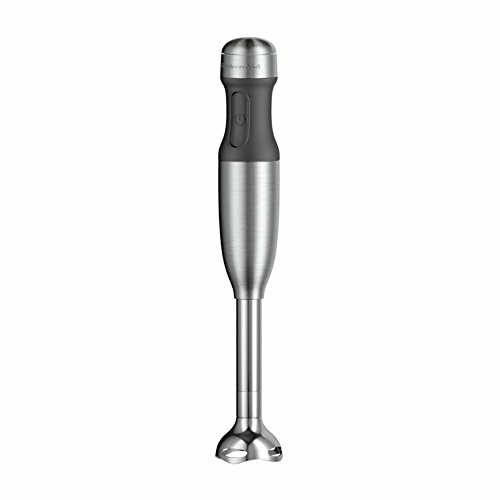 This hand blender features a modern, passion-inspired Color, custom chrome finishes, and 8 blending arm. Quickly and easily blend anything from smoothies to soup and so much more. 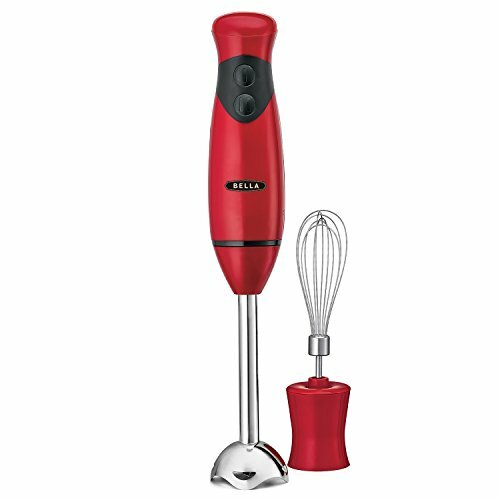 With 2 speeds and a powerful motor you can blend and puree with ease. And, the soft grip handle offers a non-slip and comfortable grip while continuously blending ingredients. Passion Red embodies the energy, strength and passion to create possibility in the kitchen. Sleek chrome accents celebrating 100 years of KitchenAid brand. Removable 8 Blending arm with Fixed s-blade to quickly blend ingredients. Soft grip handle with non-slip and comfortable grip. 2 speeds and a powerful motor to blend and puree with ease. Model KHB1231QHSD includes (1) 8 Blending arm with Fixed s-blade, (1) 3-cup BPA-free blending jar with lid. Aicok 4-in-1 Hand Blender is designed to meet your different cooking needs. You can be more elegant in the kitchen, never have to worry about the troublesome cleaning! 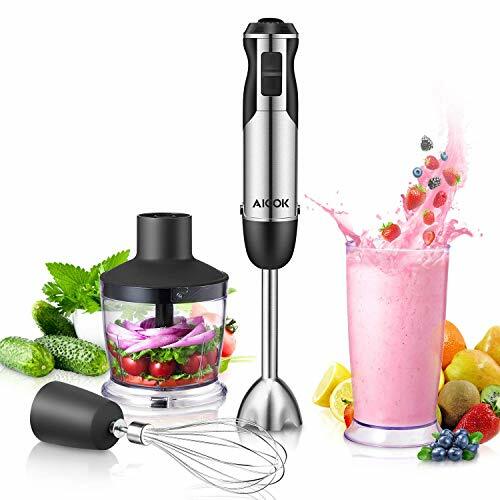 Wide Range of Uses: Aicok Hand Blender is a versatile blender which is ideal for chopping fruits,nuts, cheese and is great for whipping cream, egg whites and other delectable treats. 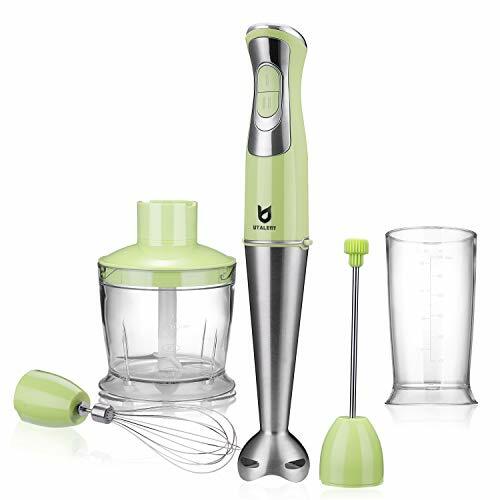 Powerful Performance: Powerful 400 watt motor handles more blending tasks quietly and with ease.Aicok immersion blender offers you convenient speed control of 6 dial. 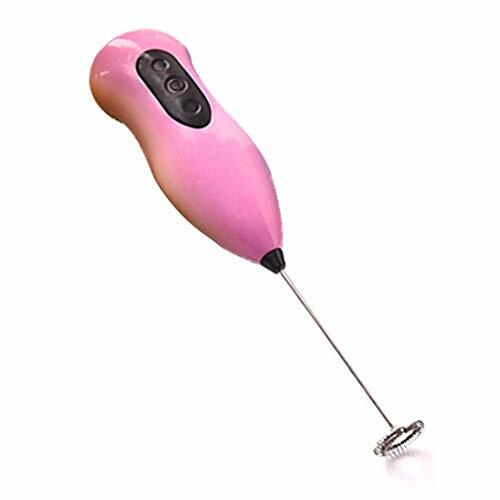 Easy to Use:Just press a button and the blender will start working.The ergonomic, non-slip soft silk touch rubber handle makes it easy for small hand women to hold the Aicok blender. The mixer is easy to disassemble, can be washed in the dishwasher. Health and Nutrition:Aicok blender maximizes the protection of food fibers from damage, is the first choice for people who are looking for a healthy life.The containers are all made of BPA-free materials and do not produce any harmful substances during use. Warranty: Friendly customer service, 30-day unconditional money-back and 2-year quality guarantee. Aicok has complete confidence in its products and guarantees for 24 months.